A year of beauty and truth, death and collapse, frugality and austerity, exuberance and indulgence, of conceptual wranglings and contextual limitations, of the future and the past, of challenging and exigency. However, in many ways it is a year just like any other. We have flux, we have a change, we have peaks of progress and complexities and confusions. Name your year and I’ll show you a battle between two opposing arguments. In 2016, architecture has made us look outwards as well as within. In this article we explore some of the places, exhibitions and events we’ve seen and enjoyed, and some of the other notable events that have rippled through our world, always with an eye on how it has reflected the world back towards us. Coming at us like a herd of stampeding elephants Alejandro Aravena’s Venice Biennale grappled with the concept of a world in struggle. The theme Reporting from the Front sounds like a battle, and can be pitched as such. Aravena offered his creation story or founding myth in a true story of the writer Bruce Chatwin coming into contact with the archaeologist Maria Reiche wondering around the Peruvian desert and carrying a large step ladder. She would place the ladder down at intervals and climb up right to the top. From there her view changed dramatically. Standing on the ground one could only see stones, but from the top of the ladder a bird, a jaguar, a flower, all these things came into view. She was of course standing above the famous Nazca lines. With that, the concept of the front beckons us. Aravena wants us to see the world from a new perspective by bringing the front to us. The concept was solidified in bringing together exhibitions of simple, or simpler materials, and less demanding ideas. Critical to the spread of international collaboration were the national pavilions. Thirty in all and all beacons of urgency and hope. Creative explorations of themes allowed each national pavilion to speak a story untold, or to retell a story along with a new narrative spin. Unfinished, the Spanish Pavilion, is an exemplary example of this retelling. It documents the ruins of never-finished building projects in a country that was hit hard by global recession. The metal structures magnify and frame the narrative, in which the derelict buildings were reimagined and built for new purposes. The British Pavilion drew upon London’s housing crisis, yet with a distinctive international look – perhaps alluding to the idea that it could be any large metropolitan city. Clothes, cleaning products, accessories and other assorted items are centralised and propose communitarian forms of ownership in a world of limited space and limited cash. This year’s Serpentine Pavilion, located at London’s Kensington Gardens, found beauty in the void and in the space between objects. Bjarke Ingels and his firm BIG played effortlessly with scale and materials to create a structure filled with light and feeling like it was made from light itself. For the pavilion concept, entitled ‘Unzipped Wall’, the BIG team explored previous Summer Pavilion designs, and you can sense a kind of genealogy between Gehry’s deconstructed form with heavy Douglas Fir and Fujimoto’s light orthogonal grid. Beyond BIG’s Unzipped Wall, Kensington Gardens became a playing field for mini-pavilions created by Kunlé Adeyemi, Barkow Leibinger, Asif Khan and Yona Friedman, a climax to the architecture programme introduced by the retiring director Julia Peyton-Jones. Built a few steps from Queen Caroline’s Temple these pavilions intertwined with its classical style. Early this year we lost Zaha Hadid, a great visionary and renowned talent. But we didn’t have to wait long to get another glimpse of her audacious genius. 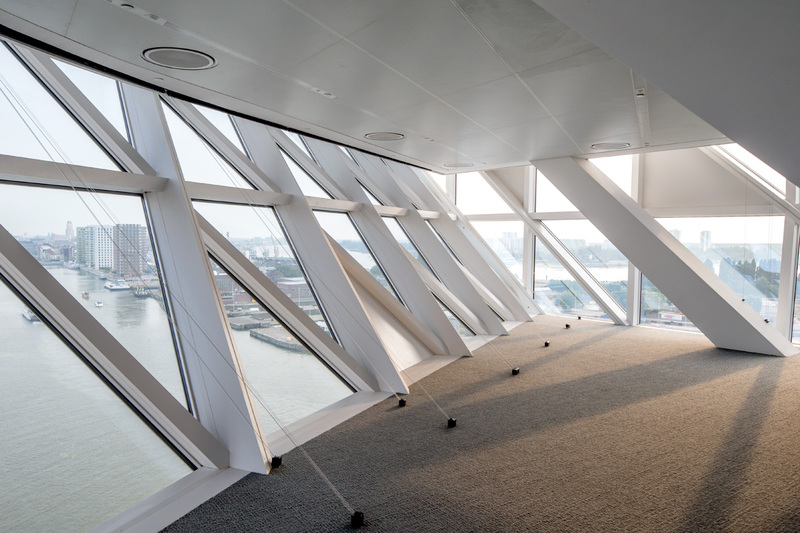 Port House, inaugurated in September, is a stunning work that achieves the goal of unifying Antwerp port’s 500 staff. 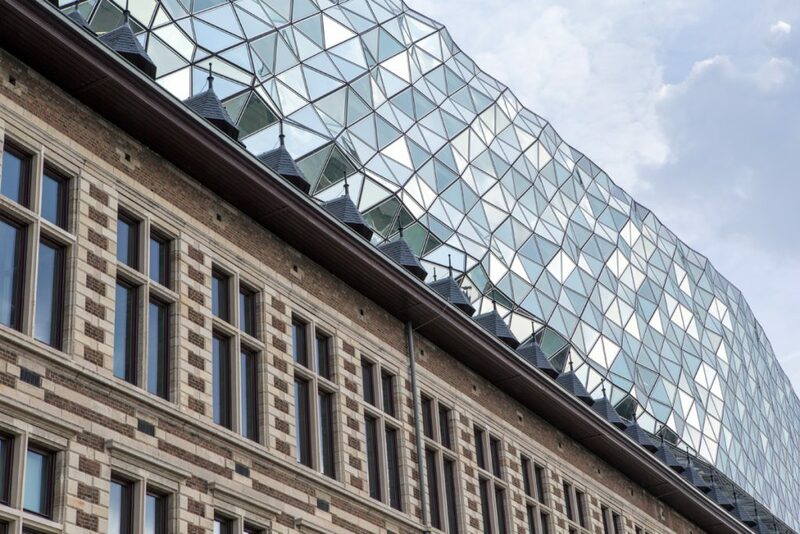 While reusing and renovating the redundant fire station it sits above, reflecting the fluidity of the surrounding city, the Scheldt river and the busy working environment of the port. 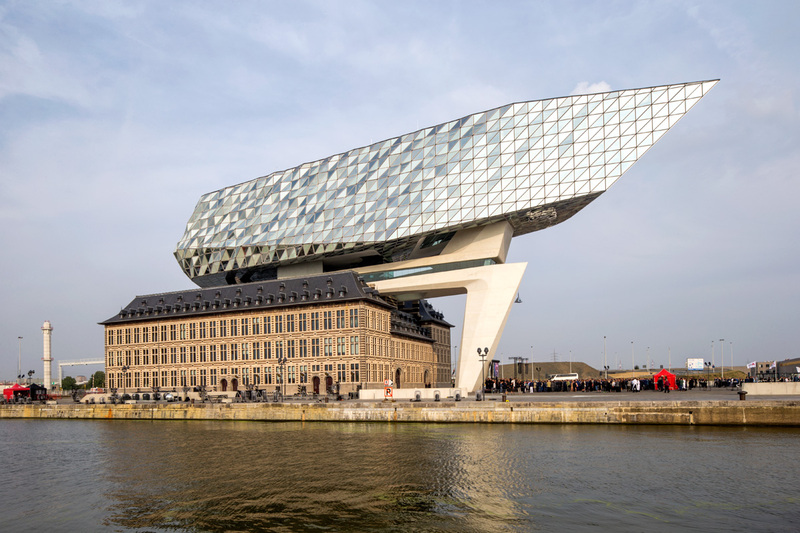 With a mix of transparent and opaque triangular facets, the vast extension looks like a leviathan lurching from the water with its scales shooting off streams of light back towards the port. The fire station is an imposing building with elements of Hanseatic design and it’s renovation has allowed the retention of the old with the new firmly seated above it. Retaining the old is important for us as humans. It’s a link to the past, a link back to the values and culture that’s embedded within our internal narrative, the story of ourselves. As one of the many London Festival of Architecture events Grand Tour Magazine hosted a talk, held within a rescued and restored Futuro House. Stationed on the roof of Central Saint Martins in London, the original 1960s house is on loan from artist Craig Barnes, who was one of the panellists alongside Ruth Lang and Andreas Lang from the university’s architecture department. Experimental forms (circular spaces encourage interaction. How apt!) and 1960s ideas, enabled by today’s technology, were discussed in that very special and intimate space introduced by Marianna Wahlsten. The Lisbon Architecture Triennale was curated by Grand Tour contributor André Tavares and Diogo Seixas Lopes. Their theme The Form of Form echoed with the beautiful new MAAT museum, which opened in Lisbon at the same time and housed some of the Triennale events. Tavares sees form (public infrastructure) as the way to move beyond austerity, opining ‘The way to overcome is to build’. At the IABR (International Architecture Biennale Rotterdam), chief curator Maarten Hajer set out the idea of the energetic society – a society which focuses not on what the state can do for its people, but what people can do for themselves. Alternative models were on the radar throughout 2016, and the most infamous moment from this year was Patrik Schumacher’s eight-point plan at Berlin’s World Architecture Festival. His target, London’s creaking housing sector, came under sustained attack, including the suggestion that even Hyde Park could become a new city under the privatisation of public space. The most widespread outraged surfaced from this comment on second home ownership. So with that, we look not backwards but forwards, to a 2017 that offers new solutions, new ways of thinking and new ways of addressing the challenging complexity of the modern world. We hope that you’ll stay to join us on this journey.